If you thought there’s no lyricism in the world of credit cards and savings– think again, but also think twice about what credit card super offer you sign up for: it might always conceal a trap. This specifically has to do with so-called ‘honeymoon rates’ that banks offer new credit card users at the beginning of the contractual period. While it is common knowledge that whatever is written in the fine print of a contract – any contract – should be checked, double-checked and triple checked, the recent ‘plastic fantastic’ reforms have drawn increased attention to the fine print of credit card and savings offers. The special conditions that apply to the lower interest rates your bank offers you initially, might be more special than you imagine, experts say. The same experts agree that this trend, of concealing actual terms and conditions on savings products, has been brought on by the recent credit card reforms. It matters less whether or not you do, in actuality hold a credit card, when it comes to the reforms. Perhaps you don’t–perhaps you are a cautious spender and are simply looking for a good way to save some money in the bank. Even in this case, it is still advisable to put yourself up to speed with the credit card reforms. They are bringing more transparency for your benefit to the table, and the main area in which they’re operating change is that of increasing your credit limit. As analysts and government officials are urging, the smart move on your part here would be learning not to live beyond your means. Banks are no longer allowed to send you invitations to increase your credit, without your specifically expressed approval. What does this mean? That you will no longer receive unsolicited offers, either in your mailbox or via other means—i.e., no longer will you be tempted to ask for more money, even when you know you can’t make more than your minimum monthly repayments. However, when it comes to special offers, it seems banks are finding all the right loopholes to lure you in and make sure they continue to make heaps of money off your back. In brief, the ‘honeymoon rate’ is usually a period of twelve months at the beginning of your contract with the bank, during which you receive a very convenient interest rate. While this may all sound well and good, the truth is somewhat different. The Reserve Bank of Australia recently dropped their base by 1.25 points. What are the famed ‘big four’ doing about it? Different things, which essentially amount to more money for them? According to News.com.au, Westpac, for instance, has amped up promo rates on the eSaver account over the past twelve months, thus bringing it up to 5.1% for all new clients. However, under the surface, the bank has severed their base rate by more than the official 1.25 points of the RBA—it is now down by 1.5 points, down to a slender 3.5%. Similar things are afoot with offers from the Commonwealth Bank and the National Australia Bank, which are enforcing the RBA 1.25-point cut on the base rate. The ANZ offers no such promotional rates, but the overall trend is apparent enough. As the credit card reforms continue to change the world of banking in more ways than immediately obvious, you, the user, have a multitude of useful tools at your disposal. Research for this article revealed the savings comparison tool available from Bankwest (http://www.bankwest.com.au/personal/savings-term-deposits/savings-term-deposits-overview), which anyone who plans on opening a savings account should consult. Given the newfound, Government-imposed transparency of credit card offers, it seems that banks are worried fewer people will rush to increase their credit limit. As such, they are willing to compensate by drawing in more deposits, for which they pay as little interest as possible. 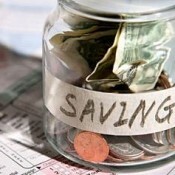 However, the savvy saver knows where to look, and there’s no stopping you from becoming such a saver.